Advantages: Good coverage of a broad, colourful and interesting subject in text, photos and profiles; excellent appendices. Aviatik Production is a Polish company based in Bytom, Poland and, as can be expected from a company based in Poland, the text of this book is in both the English and Polish languages. This publication differs somewhat from what we have seen from books of this sort in the past. Whilst the captions of the photographs are in both languages, the first 77 pages of the text are in English only with the final 23 in Polish which makes for much easier reading as far as I'm concerned. 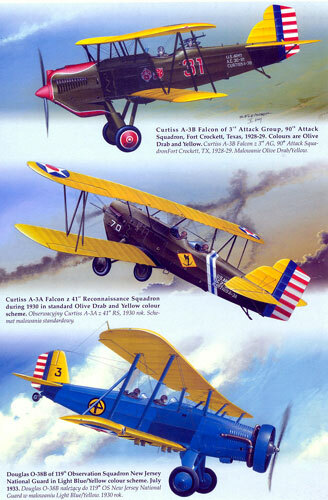 Basic Colour Schemes of USAAC Aircraft. Painting of the Aircraft Interior Surfaces. Special Marking and Colour Schemes. 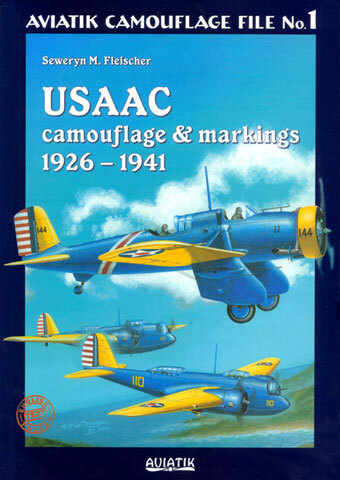 As can be expected, there were a lot of changes in both the aircraft and the colours and markings that they wore in the 15 years that the book covers but it manages to capture the period well and provides this in an easy to understand format. The Polish/English language translations are a little quirky but once you are aware of it you get used to them � not a criticism just an observation. The text is illustrated with black and white photographs, many that I have not seen published before. Colour is limited to side profile paintings and the artwork of the covers. The only colour photographs are those on the back cover. Especially welcome are the four appendices which assist the reader in deciphering the system of aircraft markings according to their types and assignments, modern day FS 595B matches to the paints used during the period covered and the production codes assigned to aircraft manufacturers. All up, a well presented book that provides good 'meat and potatoes' information at a reasonable price.